What is a Stream Cleanup? 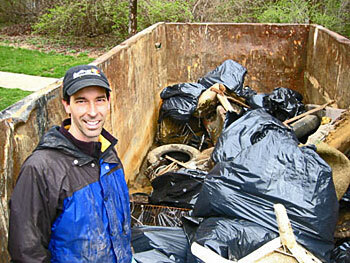 A stream cleanup is an organized trash removal effort. It usually takes place next to a stream or river, but it can focus on the land area or storm drains that flow to a local stream or water body. Why Should I Organize a Stream Cleanup Event? The Potomac River provides 480 million gallons of drinking water to the Washington area and 100 million gallons of ground water to rural regions. It is a symbol of the health of our community. What does it say about us when we allow trash to line the river shoreline and lodge in its streambeds? Plastic bottles, styrofoam, food wrappers, coffee cups—you name it and it’s in our Potomac River and it’s tributaries! How did most of this trash get there? As water washes down our sidewalks and streets, then into storm drains, it carries with it whatever is in its path. Storm drains then dump the water and litter into nearby tributaries, or into the river itself. Waterway cleanup projects are valuable learning experiences. 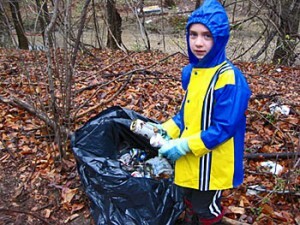 For example, a Saturday morning spent collecting litter from a local stream establishes a connection between citizens and the stream that runs through their community. Citizens are able to see, first-hand, the impacts of their cleanup efforts on the condition of the stream and quality of the water. Ultimately, such cleanups encourage and empower citizens to participate in other activities aimed at improving water quality. 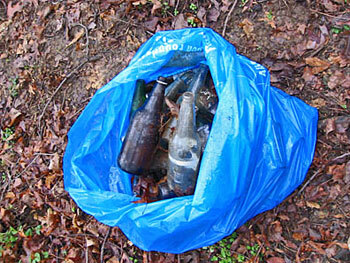 Stream cleanups require a very small budget, but, unfortunately there is a lot of trash out there! Coming up with the funds to put on a stream cleanup should be pretty easy; however, setting your goals may be a little more difficult. The cost associated with putting on a watershed cleanup can be as low as the cost of your time. Cleanups provide excellent publicity and businesses are often willing to cover the costs of necessary items. Because it does not cost a lot of money to put together a cleanup, you may not require any help in financing your work. If you are interested in getting some help to accomplish your goals, there are a lot of places to look for it. Your local dump—the most expensive part of any cleanup are the tipping and hauling fees. Request to have the tipping fees waived for the vehicles carrying the garbage collected from your cleanup. Trash collection services—you may be able to get a local trash collection service to donate their services in picking up and hauling the trash you have collected. You can also ask the property owner if s/he will arrange for the pickup and hauling away of the trash you collected—after all, you just helped clean their property! 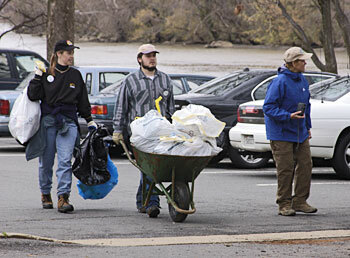 The Alice Ferguson Foundation—They organize a Potomac River Cleanup Day the first weekend in April every year. If you register your site with them, they will provide you with trash bags and gloves for your work. Local business people, club leaders, and government officials. Ask them to give what they can: cash, equipment, supplies, or services. When approaching potential donors, use the Sponsorship letter template in the Resources section below. Trash bags are a must and can often be obtained as “in-kind” donations from grocery or supply companies. Food and drinks for the workers are essential and can usually be obtained through donations. Restaurants and local grocery stores might give you refreshments. Don’t forget first aid. The local fire department, Red Cross, or other emergency medical personnel may be willing to donate first aid kits and supplies, or they may even be interested in volunteering to serve as trained first aid administrators during the cleanup. 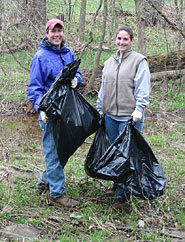 Establish an organizing committee: a core group of individuals dedicated to organizing and implementing the stream cleanup. Determine the waterway cleanup project site. It could be a river, stream, creek, pond, lake, or anywhere litter has accumulated. Projects can be on public lands, such as parks, community property, or open space. Projects can also be on private property, in which case you might include individual landowners. Whether the site is public or private property, the organizing committee must receive permission to be on the land prior to the project date. Also make sure your site is convenient for you and your group in terms of access and parking. A member of the organizing committee should walk the stream 8 to 10 weeks before the cleanup. A scouting survey of the stream section to be cleaned will give a better idea about the amount and types of litter volunteers will be exposed to. A survey will also allow the committee to approximate how many volunteers will be needed for the cleanup. A member of the organizing committee should also walk the stream two weeks prior to the project date. During this walk, the committee member should create a series of maps that will help cleanup crews locate accumulations of litter. Survey information might include sizes, types, and abundance of objects. The surveyor should also note whether objects can be hauled out on foot and, if not, whether a truck is necessary. Is the site safe (please consider steep slopes and class of rapids)? Is the site accessible to volunteers (easy to enter and exit)? What was the site used for in the past? Is the site too large for a single cleanup day or will several cleanups be required? What types of trash or debris are present? Are there any sensitive areas that should be treated with care? Are there hazardous substances or items present that make a stream unsuitable for a cleanup by volunteers? Determine the date 8 to 10 weeks before the event. Typically, Saturday mornings are the best time to schedule a cleanup. Be careful to avoid a holiday weekend or a weekend when the switch is made to and from Daylight Savings Time. The organizing committee should also allow adequate time for project planning and volunteer recruitment. If equipment will be borrowed, the organizing committee should make these arrangements first, and select a day when the equipment is available. Remember to establish a rain date! 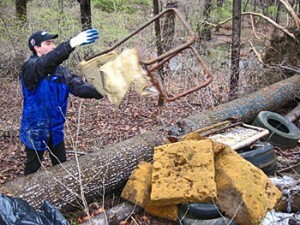 A stream cleanup typically lasts about four hours. The organizing committee should also plan an additional half-hour before the event for setup and a half-hour afterwards for cleanup. Additional time may be required after the event, if a picnic or barbecue is planned. Locate and reserve a central meeting place. The organizing committee should reserve a facility or location 8 to 10 weeks prior to the event, where volunteers will meet the day of the project. It should be no more than a 20-minute drive from the farthest stream section or litter accumulation. This central location will not only serve as the initial meeting place for project participants, but also as the location where trash bags are brought by pickup trucks for transfer to dump or trash trucks. A parking lot is an ideal central meeting place, if it’s not in use on the project date. On Saturdays, school, bank, office, or church parking lots are usually empty. The organizing committee should receive permission from the proper authorities before designating a parking lot as the central meeting place. A letter, including the project purpose, date, time, and a promise to leave the parking lot clean, will typically receive a favorable response. Avoid high traffic areas and always use extreme caution. If volunteers will not have access to a restroom, seek permission from a local business to use theirs if necessary. If facilities are not made available through local businesses, the organizing committee should arrange for the rental of portable facilities. Note: Used automobile tires are a common problem in cleanup projects. It is illegal to dispose of whole tires in city and county landfills, though many landfills do collect them for later recycling. Check with your local sanitation department for regulations regarding tire disposal. Locate the closest recycling center and speak with a center representative to confirm the days and hours of operation, acceptable items, limits on quantity of materials delivered, and specifications for advance preparation. Call and confirm this information a few days prior to the project date. If the recycling center will not be open on the project date, secure a place to store recyclables until they can be delivered at a later date. Contact the closest landfill and confirm the days and hours of operation. It may be necessary to schedule the cleanup earlier in the day to allow enough time for delivery to the landfill. Consult local, private companies that may be able to provide assistance. Cleanup crews should be instructed to deposit all filled trash bags at their assigned starting point (project organizers should remember to assign starting points – maps will be useful). Pickup trucks are useful shuttle vehicles for the collected litter. Volunteers with pickup trucks should be assigned to visit specific starting points and collect any trash bags at these locations. The organizing committee should distribute a map showing routes between the central meeting place to pickup points. Volunteers will transport these bags from pickup points to the central meeting location, where they can be transferred to dump or trash trucks. The number of trucks needed depends on the amount of litter and size of the items (determined in the site survey). If there are not enough pickup trucks volunteered prior to the project date, the organizing committee should explore other options, such as your local Litter Control and Recycling coordinator or the local Department of Public Works/Utilities. If conducting a cleanup by canoe, a motor boat may also serve as the shuttle vehicle responsible to depositing collected litter at the central meeting location. Obtain written permission from landowners with property in the proposed cleanup section. Venturing onto private property without permission is trespassing; you may be subject to arrest. The organizing committee should invite the property owner to participate in the cleanup. If the property owner cannot participate, the organizing committee should obtain written permission for volunteers to clean up the trash along the stream where it passes through their land. If you are unsure of the landowner, county tax maps, located in county planning offices, can provide property ownership information. The organizing committee can also determine the property owner by talking to people who live close by. Before sending the cleanup teams out, the organizing committee should emphasize the importance of staying on public property and public roads, except where expressed permission has been given by the property owner. Recruit stream cleanup volunteers from the local community. Anyone can assist in a stream cleanup project. Children under the age of 18 years should be encouraged to participate but should have permission from parent or guardian. The organizing committee should provide adequate supervision: one adult supervisor for every six children. Initiate volunteer recruitment approximately 6 weeks prior to the project date. The number of volunteers needed depends upon the area to be covered and the magnitude of litter accumulations. Typically, a two-person team can cover one mile of a lightly littered stream channel in about one or two hours. As a rule, 50 percent of those people who initially sign up for an event will not actually participate. For this reason, the organizing committee should recruit twice as many people that will be needed for the project. If more people show up than anticipated, volunteers can work in larger teams. The organizing committee should establish a phone number (contact person) whom volunteers can call to register for the event. When volunteers register, get their names, addresses and telephone numbers. As volunteers respond to recruitment activities, members of the organizing committee should advise them on what to bring and how to dress. Volunteers should be prepared to walk or canoe distances, get wet and get dirty. Recommend that volunteers wear sturdy shoes or boots, long pants, a long-sleeved shirt, work gloves, and a hat or outerwear as the weather dictates. Volunteers should also be encouraged to use sunscreen and insect repellant. The organizing committee should recruit, from the volunteer labor force, several field supervisors or site captains who will assist volunteers during the cleanup. Approximately one supervisor should be recruited for every 10 volunteers. The organizing committee should host a training session for these supervisors prior to the project date, so that their role can be defined. The organizing committee should send reminders of the date (and rain date) and time of the event, as well as maps showing the location of the central meeting place to all registered volunteers one week before the stream cleanup. If time allows, committee members may also call the volunteers a few days before the event to confirm participation in the stream cleanup. Advertise the stream cleanup project. Event publicity should complement your volunteer recruitment efforts. Volunteer recruitment should be initiated at least 6 weeks in advance of the project date. This time will allow the organizing committee to draft, reproduce, and distribute fliers; draft and distribute press releases to local newspapers and/or organizational newsletters, and offer presentations at group meetings. Recruitment messages should include the name, day, date and starting time of the event, the rain date, location and directions to the central meeting place, name of the adopting group or organization, and a contact’s name and phone number. Recruitment messages should be enthusiastic and include a “sales pitch.” A sales pitch should emphasize the enjoyment of the activity and emphasize proximity to potential volunteers. Use direct mail for members of the adopting group or organization and similar groups. This type of targeted mailing will be more fruitful than a mailing to a “cold list”—individuals who may not be familiar with your activities. Have a phone number, website, or email where volunteers can register and include the information in all advertisements. 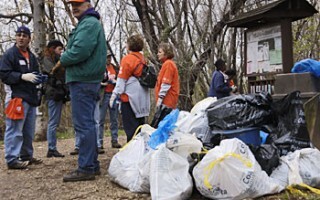 Coordinate cleanup events with other events and/or projects, such as Clean Virginia Waterways, Alice Ferguson Foundation’s Trash Free Potomac Watershed Initiative, Earth Day, or Community Cleanup, and your project will benefit from greater exposure. Don’t forget newsletters, church bulletins, schools, and speakers’ bureaus. Many civic organizations have newsletters and welcome speakers at their meetings. Displaying posters and other printed materials in busy locations is also a good way to reach and inform the public. Gather cleanup equipment and materials. Equipment can often be borrowed from state or local government offices and/or local environmental organizations. The organizing committee should make arrangements to have borrowed equipment delivered or picked up and then returned. Any equipment that cannot be borrowed should be purchased two to three weeks prior to the project date. Refreshments are one way to thank volunteers for their valuable time and hard work. It is recommended that the project sponsor provide non-alcoholic beverages. If beverages will not be provided, the organizing committee should encourage participants to bring their own. Participants should be reminded to avoid drinking water from any stream and encouraged to take breaks and drink fluids to avoid overexertion. Simple refreshments (coffee and doughnuts, cookies and punch) may be offered during registration, or at a time for volunteers to celebrate a job well done at day’s-end. A picnic or barbecue are also nice ways to thank volunteers. Local businesses and/or the volunteers themselves (pot-luck) may be willing to donate food/drink, coolers, cups, ice, paper goods, etc. The organizing committee could also consider providing rewards, such as certificates, bumper stickers, tote bags, caps, or t-shirts. The committee may solicit contributions, both monetary and in-kind services, from local businesses. Including handouts and other educational materials in your stream cleanup program is another option. All volunteers must complete and sign a liability release form (template in the Resources section below). Immediately before the cleanup is also a good time to deliver any educational messages. Sensitive areas of the site should be cordoned off with flagging. Private property boundaries should also be identified with flagging to avoid inadvertent trespassing. Also think about introducing your river. Many people have an interest in their local streams but don’t understand much about river systems. You may wish to provide a map of your local waterway so that people can orient themselves in the watershed and make the visual connection between their home and the river. Make people aware of the benefits of the clean up to downstream neighbors, aquatic life and their drinking water. Be sure to emphasize the importance of the participants’ safety before sending them out. Make sure that the participants work in teams and that you know where your participants are going and when they will return. Make sure to account for your participants as they return from their assigned areas. For larger cleanup events, motor boat assistance provided by the U.S. Coast Guard, local fishing groups, or individual citizens may be used to transport trash from canoes or boats to the central meeting place. If there are no pickup arrangements with the local government, volunteers should haul trash to the landfill and recyclables to the recycling center as needed. Make your cleanup as enjoyable as possible for volunteers. Consider providing music—a local band willing to play at the site or even a portable radio or two can lighten the mood and turn the work into an enjoyable event. Locate a convenient shady spot where workers can rest, and provide seating and refreshments. Plenty of drinking water is a must, and local restaurants or grocery stores may be willing to donate ice, juices, soft drinks, or snacks. Allow time at the end of the day for participants to relax, socialize, and enjoy the fruits of their labor. Take the time to weigh the trash. One important measure of success is how much litter and debris was removed, and this is commonly expressed in pounds or tons. Volunteers will need to weigh the trash they collect to determine this. There are two options for determining the weight of the trash collected. If you are trying to compare the weight of recyclables versus non-recyclables, you may want to count and weigh individual bags on a bathroom scale. Bathroom scales measure up to 300 pounds and can also be used to weigh individual bags. For large cleanups, this may not be practical. You can estimate the weight of a bag by assuming that the average bag weighs thirty pounds. To get an exact weight you will probably need to count the number of bags on the truck and weigh the entire load on either portable or permanent platform scales. A platform scale is a scale you drive onto with the entire vehicle. The total weight of the trash is determined by subtracting the weight of the vehicle. Most landfills and major recycling centers have platform scales. To get the weight per bag, divide the number of bags into the total weight of the trash. You may wish to create your own data forms to collect additional information; for example, whether any animals are observed that have been injured by trash. If recycling proceeds are given to charity, you may want to list the amount of money raised. After the cleanup, remember to collect the sign-in sheets. Use this information to generate certificates of appreciation for each volunteer and organization involved in the cleanup. You can also compile the information into a community database of individuals and organizations to facilitate networking among groups and individuals interested in water quality issues. Arrange for photos to be taken before, during, and after the event and publish them along with the totals. Contact the local media who helped you advertise before the cleanup and share your results. Also contact the event sponsors sending them a thank-you and the results of the cleanup. Be sure to recognize everyone in the community who made your success possible. When the event is completed, it is important to evaluate what you accomplished. It will help future planners to capitalize on your successes and avoid your mistakes. But you can’t wait until the end of the event to think about evaluation. An evaluation committee should be chosen in the planning stage to monitor the entire sequence of events, noting what worked well and what went wrong. Poll your volunteers as they leave, either by providing a questionnaire or by simply having the zone captains ask their crews what they thought of the event. Within a week, get your committee together and make a list of what went well, what needed improvement, and what, if anything failed completely. What problems did they have? What would they do to improve future events? The evaluation committee should compile a final report of what they’ve learned. With this report, you’ll be well on your way toward an even more successful cleanup next year.